The most crucial game of the last round was another loss of Fort Wayne Mad Ants (14-13) in Lakeland on Saturday night. Visitors were defeated by Magic (16-10) 107-92. Magic made 16-of-17 free shots (94.1 percent) during the game. Magic outrebounded Fort Wayne Mad Ants 53-39 including a 39-27 advantage in defensive rebounds. They looked well-organized offensively handing out 22 assists. Forward Amile Jefferson (206-93, college: Duke) stepped up with a double-double by scoring 21 points and 10 rebounds for the winners and guard Troy Caupain (193-95, college: Cincinnati) chipped in 24 points. Magic's coach used a ten-player rotation which allowed the starters a little rest for the next games. The best for the losing side was guard Edmond Sumner (198-95, college: Xavier) with 29 points (went 7 for 7 at the free throw line). Magic have a solid series of three victories in a row. They maintain first place with 16-10 record, which they share with Raptors 905 and Stockton K. Fort Wayne Mad Ants at the other side still keep top position with 13 games lost. They share it with Erie Bay H.. Both teams do not play next round, which will be an opportunity for some rest. Third-ranked Erie Bay Hawks (14-13) gave a tough game to first ranked Long Island Nets (19-8) in Uniondale. Long Island Nets managed to secure only one-point victory 88-87. However their fans expected easier game. It ended at the same time the three-game winning streak of Erie Bay Hawks. Forward Theophilus Pinson-Jr (198-95, college: N.Carolina) nailed 19 points, 8 rebounds and 7 assists for the winning side and Shannon Scott accounted for 15 points and 4 assists. Forward Terrence Jones (206-92, college: Kentucky) came up with 26 points, 8 rebounds and 6 assists for Erie Bay Hawks in the defeat. Erie Bay Hawks' coach tried various players' combinations and tested in total eleven players in this game, but that didn't help. Long Island Nets maintains first place with 19-8 record which they share with defeated Erie Bay Hawks. Erie Bay Hawks at the other side still keep top position with 13 games lost. They share it with Ft.Wayne MA. Both teams do not play next round, which will be an opportunity for some rest. A very close game took place in Frisco between Northern Arizona Suns and Texas Legends. Fifth ranked Northern Arizona Suns (6-23) got a very close victory on the road over 4th placed Texas Legends (9-20). Northern Arizona Suns managed to escape with a 1-point win 117-116 on Saturday evening. The best player for the winners was Peter Jok who scored 24 points and 5 rebounds. At the other side the best for losing team was Raymond Spalding who recorded a double-double by scoring 22 points, 17 rebounds and 4 assists. Both coaches used bench players in such tough game. Northern Arizona Suns have a solid series of three victories in a row. They maintain fifth place with 6-23 record. Loser Texas Legends keep the fourth position with 20 games lost. They share it with Iowa W.. Both teams do not play next round, which will be an opportunity for some rest. Very important is a road loss of second ranked Capital City Go-Go (15-11) against fifth ranked Herd (5-22) on Saturday night. Visiting Capital City Go-Go was defeated by Herd in a tough game in Oshkosh 105-109. It was a good game for Christian Wood who led his team to a victory with a double-double by scoring 34 points (!!!) and 23 rebounds. Capital City Go-Go's coach let to play ten players, but that didn't help to avoid defeat in this game. Herd maintains fifth place with 5-22 record. Newly promoted Capital City Go-Go keeps the second position with 11 games lost. Both teams do not play next round, which will be an opportunity for some rest. The game between Top Four teams took place in Greensboro. 4th placed host Greensboro Swarm (12-15) lost to third ranked Raptors 905 (16-10) 107-103. Chris Boucher stepped up and scored 27 points, 7 rebounds and 5 blocks for the winners. Both coaches tested many bench players in such tough game. Defending champion keeps a position of league leader, which they share with Lakeland M. and Stockton K. Loser Greensboro Swarm keeps the fourth place with 15 games lost. Both teams do not play next round, which will be an opportunity for some rest. There were no shocking results in the rest of the games of round 69: Agua Caliente C. lost to Stockton K. on the opponent's court 103-119. Iowa W. was outscored by Austin S. in a home game 86-106. Westchester K. managed to beat Delaware BC on the road 103-94. Maine RC was defeated by Canton C. on its own court 95-103. The most impressive stats of the last round was 15 points, 10 rebounds and 6 assists by Daniel Ochefu of Stockton K.. The game between Top Four teams took place in Greensboro. 4th placed host Greensboro Swarm (12-15) lost to third ranked Raptors 905 (16-10) 107-103. Raptors 905 forced 19 Greensboro Swarm turnovers. Great defensive blocking was one of the keys in this match when Raptors 905 made 9 blocks. Greensboro Swarm was plagued by 24 personal fouls down the stretch. 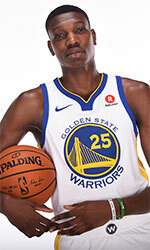 Canadian-Saint Lucian power forward Chris Boucher (208-93, college: Oregon) stepped up and scored 27 points, 7 rebounds and 5 blocks for the winners and guard Jordan Loyd (193-93, college: Indianapolis) chipped in 22 points, 6 rebounds, 7 assists and 4 steals. The best for the losing side was guard Jaylen Barford (191-96, college: Arkansas) with 22 points and 6 rebounds and power forward Chinanu Onuaku (208-96, college: Louisville) produced a double-double by scoring 14 points and 13 rebounds. Four Raptors 905 and five Greensboro Swarm players scored in double figures. Both coaches tested many bench players in such tough game. Defending champion keeps a position of league leader, which they share with Lakeland M. and Stockton K. Loser Greensboro Swarm keeps the fourth place with 15 games lost. Both teams do not play next round, which will be an opportunity for some rest. The most crucial game of the last round was another loss of Fort Wayne Mad Ants (14-13) in Lakeland on Saturday night. Visitors were defeated by Magic (16-10) 107-92. Magic made 16-of-17 free shots (94.1 percent) during the game. Magic outrebounded Fort Wayne Mad Ants 53-39 including a 39-27 advantage in defensive rebounds. They looked well-organized offensively handing out 22 assists. Forward Amile Jefferson (206-93, college: Duke) stepped up with a double-double by scoring 21 points and 10 rebounds for the winners and guard Troy Caupain (193-95, college: Cincinnati) chipped in 24 points. Four Magic players scored in double figures. Magic's coach used a ten-player rotation which allowed the starters a little rest for the next games. The best for the losing side was guard Edmond Sumner (198-95, college: Xavier) with 29 points (went 7 for 7 at the free throw line) and Jamaican-American forward Omari Johnson (206-89, college: Oregon St.) scored 17 points and 7 rebounds. Magic have a solid series of three victories in a row. They maintain first place with 16-10 record, which they share with Raptors 905 and Stockton K. Fort Wayne Mad Ants at the other side still keep top position with 13 games lost. They share it with Erie Bay H.. Both teams do not play next round, which will be an opportunity for some rest. Very important is a road loss of second ranked Capital City Go-Go (15-11) against fifth ranked Herd (5-22) on Saturday night. Visiting Capital City Go-Go was defeated by Herd in a tough game in Oshkosh 105-109. Herd made 30-of-35 charity shots (85.7 percent) during the game, while Capital City Go-Go only scored fourteen points from the stripe. They outrebounded Capital City Go-Go 52-35 including a 39-24 advantage in defensive rebounds. 26 personal fouls committed by Capital City Go-Go helped opponents get some easy free throw opportunities. It was a good game for forward Christian Wood (208-95, college: UNLV, agency: Pensack Sports) who led his team to a victory with a double-double by scoring 34 points (!!!) and 23 rebounds. Guard Michael Qualls (197-94, college: Arkansas) contributed with 23 points, 9 rebounds and 5 assists for the winners. Four Herd players scored in double figures. Swingman Jordan McRae (197-91, college: Tennessee) answered with 37 points (!!!) and 5 assists and forward Devin Robinson (203-95, college: Florida) added 20 points in the effort for Capital City Go-Go. Capital City Go-Go's coach let to play ten players, but that didn't help to avoid defeat in this game. Herd maintains fifth place with 5-22 record. Newly promoted Capital City Go-Go keeps the second position with 11 games lost. Both teams do not play next round, which will be an opportunity for some rest. A very close game took place in Frisco between Northern Arizona Suns and Texas Legends. Fifth ranked Northern Arizona Suns (6-23) got a very close victory on the road over 4th placed Texas Legends (9-20). Northern Arizona Suns managed to escape with a 1-point win 117-116 on Saturday evening. Northern Arizona Suns looked well-organized offensively handing out 28 assists. The best player for the winners was Sudanese-American guard Peter Jok (198-94, college: Iowa) who scored 24 points and 5 rebounds. Hollis Thompson (203-91, college: Georgetown) chipped in 14 points, 7 rebounds and 4 assists. At the other side the best for losing team was forward Raymond Spalding (208-97, college: Louisville) who recorded a double-double by scoring 22 points, 17 rebounds and 4 assists and guard Wade Baldwin-IV (190-96, college: Vanderbilt) added 25 points, 7 rebounds, 6 assists and 4 steals respectively. Both teams had five players each who scored in double figures. Both coaches used bench players in such tough game. Northern Arizona Suns have a solid series of three victories in a row. They maintain fifth place with 6-23 record. Loser Texas Legends keep the fourth position with 20 games lost. They share it with Iowa W.. Both teams do not play next round, which will be an opportunity for some rest. The game between closely ranked teams ended with 3rd placed Clippers' (12-13) road loss to second ranked Kings (16-10) 103-119 on Saturday. Kings made 21-of-21 free shots (100 percent !!!) during the game. They looked well-organized offensively handing out 32 assists. Guard Marcus Williams (191-85, college: Connecticut) stepped up with a double-double by scoring 20 points and 14 assists for the winners and Nigerian forward Daniel Ochefu (211-93, college: Villanova) chipped in 15 points, 10 rebounds and 6 assists. Kings' coach allowed to play the deep bench players saving starting five for next games. The best for the losing side was Dominican forward Angel Delgado (206-94, college: Seton Hall) with 21 points and 9 rebounds and forward Jamel Artis (201-93, college: Pittsburgh) scored 21 points and 4 assists. Both teams had five players each who scored in double figures. Kings keep a position of league leader, which they share with Lakeland M. and Raptors 905. Loser Clippers keep the third place with 13 games lost. Both teams do not play next round, which will be an opportunity for some rest. The game between closely ranked teams ended with third ranked Austin Toros' (14-15) road victory over 4th placed Wolves (9-20) 106-86 on Saturday. They outrebounded Wolves 52-34 including a 43-29 advantage in defensive rebounds. Great defensive blocking was one of the keys in this match when Austin Toros made 9 blocks. Forward Drew Eubanks (208-97, college: Oregon St.) stepped up with a double-double by scoring 16 points and 12 rebounds for the winners and swingman Lonnie Walker-IV (196-98, college: Miami, FL) chipped in 21 points. Four Austin Toros players scored in double figures. The best for the losing side was guard Marquise Moore (188-94, college: George Mason) with 16 points and 5 assists and guard Jared Terrell (190-95, college: Rhode Island) scored 16 points. Both coaches allowed to play bench players saving starting five for next games. Austin Toros moved-up to second place. Wolves lost fourth consecutive game. They keep the fourth position with 20 games lost. Both teams do not play next round, which will be an opportunity for some rest. Third-ranked Erie Bay Hawks (14-13) gave a tough game to first ranked Long Island Nets (19-8) in Uniondale. Long Island Nets managed to secure only one-point victory 88-87. However their fans expected easier game. 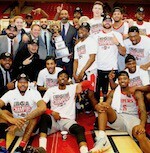 It ended at the same time the three-game winning streak of Erie Bay Hawks. Forward Theophilus Pinson-Jr (198-95, college: N.Carolina) nailed 19 points, 8 rebounds and 7 assists for the winning side and point guard Shannon Scott (191-92, college: Ohio St.) accounted for 15 points and 4 assists. Forward Terrence Jones (206-92, college: Kentucky) came up with 26 points, 8 rebounds and 6 assists and guard Jordan Sibert (193-92, college: Dayton) added 17 points respectively for Erie Bay Hawks in the defeat. Five Long Island Nets and four Erie Bay Hawks players scored in double figures. Erie Bay Hawks' coach tried various players' combinations and tested in total eleven players in this game, but that didn't help. Long Island Nets maintains first place with 19-8 record which they share with defeated Erie Bay Hawks. Erie Bay Hawks at the other side still keep top position with 13 games lost. They share it with Ft.Wayne MA. Both teams do not play next round, which will be an opportunity for some rest. Not a big story in a game in Newark, Delaware where 4th placed Blue Coats (9-14) were defeated by second ranked Knicks (17-12) 103-94 on Saturday. Knicks forced 21 Blue Coats turnovers. They looked well-organized offensively handing out 27 assists. Forward Isaiah Hicks (206-94, college: N.Carolina) stepped up and scored 27 points, 6 rebounds and 4 assists for the winners and center Jameel Warney (203-94, college: Stony Brook) chipped in 27 points and 6 rebounds. The best for the losing side was guard Shake Milton (198-96, college: SMU) with a double-double by scoring 24 points, 5 rebounds and 10 assists and forward Cameron Oliver (203-96, college: Nevada) produced a double-double by scoring 11 points and 10 rebounds. Both teams had five players each who scored in double figures. Knicks maintains second place with 17-12 record having just five point less than leader Santa Cruz W. Loser Blue Coats keep the fourth position with 14 games lost. Both teams do not play next round, which will be an opportunity for some rest. The game between closely ranked teams ended with fourth ranked Canton Charge's (11-15) road victory over 5th ranked Maine Red Claws (8-19) 103-95 on Saturday. Canton Charge looked well-organized offensively handing out 24 assists. Guard Levi Randolph (196-92, college: Alabama) stepped up and scored 25 points and 6 rebounds for the winners and point guard Kobi Simmons (196-97, college: Arizona) chipped in 18 points, 6 rebounds and 5 assists. Canton Charge's coach allowed to play the deep bench players saving starting five for next games. The best for the losing side was swingman PJ Dozier (198-96, college: S.Carolina) with 27 points, 7 rebounds and 9 assists and guard Archie Goodwin (196-94, college: Kentucky) scored 14 points and 8 rebounds. Five Canton Charge and four Maine Red Claws players scored in double figures. Canton Charge maintains fourth place with 11-15 record. Maine Red Claws lost third consecutive game. They keep the fifth position with 19 games lost. Both teams do not play next round, which will be an opportunity for some rest.